Разстояние до летището 49,2 км. Имате въпрос към Salim Cottage? Удобно разположен в Ломбок, Salim Cottage е чудесна стартова точка, от която можете да започнете да проучвате този оживен град. Оттук гостите имат лесен достъп до всичко, което този оживен град може да предложи. С удобното си местоположение хотелът предлага лесен достъп до всички градски забележителности, които задължително трябва да се видят. В Salim Cottage отличното обслужване и достъпните съоръжения допринасят за Вашия незабравим престой. Хотелът предлага достъп до широк спектър от услуги като безплатен WiFi достъп във всички стаи, 24-часова охрана, ежедневно почистване, магазин за подаръци/сувенири, индивидуално настаняване/напускане. Като допълнение всяка хотелска стая предлага широка гама от удобства. Много от стаите са с безплатен чай, гардеробна, гардеробна стая, хавлии, стойка за дрехи, за да удовлетворят и най-изискания вкус. Хотелските съоръжения като лодки, кану, туристически маршрути, наем на екипировка за водни спортове, шнорхелинг са идеално място за почивка след тежък и уморителен ден. С превъзходните си удобства и отличното си местоположение Salim Cottage е идеално място, в което можете да се насладите на престоя си в Ломбок. Все хорошо, красиво. На первой линии, по местным меркам. Расположен по середине стороны острова на которой есть жизнь. Хороший бар/ ресторан. В соседнем правда пиво дешевле на 5 000 ;) Рекомендую для 2-3 дней релакса на острове! В целом мне все понравилось. Номер большой и уютный, есть горячая вода и симпатичная веранда. шикарные коттеджи, ухоженная территория, отличный ресторан прям на берегу! Замечательное место прямо в сердце Гили Айр, отличные коттеджи, прекрасный ресторан с видом на океан, очень ухоженная территория! Всем рекомендуем! Недорого, прямо на пляже, кондиционер, просторное бунгало, горячая вода, противомоскитная сетка. Тихо. We spent a few days staying at Salem and thoroughly enjoyed it. The cottages are clean and comfortable, swimming pool great with lovely loungers. The position is excellent with a popular restaurant overlooking the sea. The staff really make this place they were friendly, helpful and great fun. I would certainly stay here again. Great location, great free breakfast, friendly staff, beautiful setting. Air conditioner had a hard time keeping up due to open rafter design of cottage. Fan in room would have helped . It’s great place to relax, location was perfect. Expected to have power outage while you’re staying. No mini Fridge in the room and no phone to call the front desk if there are any problems. The staff very attentive. The place is a little far from the harbour. Definitely not walking distance. The beach here isnt so clean but the restaurant in front of the cottage holds a majestic view of Mt Rinjani. Food choices at the restaurant is very good n staff were friendly n helpful. Overall was a happy experience. This hotel is a wonderful base for Gili Air - in just the right place for getting anywhere in the island and in the heart of the restaurants and bars. The best thing are the staff - we arrived to a misunderstanding about our second room (we wanted a twin for our boys and got a double) but very quickly they added a good quality extra bed for one night and changed rooms around to let us move the next morning. But it was not only this - the staff were friendly and helpful at all times. The villas are very comfortable and the attached restaurant/bar is friendly. We would definitely recommend this hotel. The location was the best and the personnel were very kind. The views from the restaurant were beautiful. Only minus - and a huge one - were the roosters right next to our cottage. Every single morning they started their morning crows at 6 am and we couldn't sleep after that. Very annoying. But maybe the noise isn't so bad to other cottages.. But if you wake up at 6 am anyway, this wouldn't be a problem! This place was a very pleasant surprise and it wasn't our first time on Gili Air! We stayed at the Zeus cottage; the gardens are lovely, the cottages are close together but still feel private enough. The good: - Each cottage has a hammock and a lounge outside, so you can relax with Bintang:) - Perfect location close to all the good restaurants and the clean part of the beach. - Very powerful good aircon - though if you leave it for the day it struggles a little - works well at night though. - Turtle Beach is just around the corner - go snorkelling there and you will indeed meet a turtle. - Beautiful light but filling breakfast, everything was fresh. 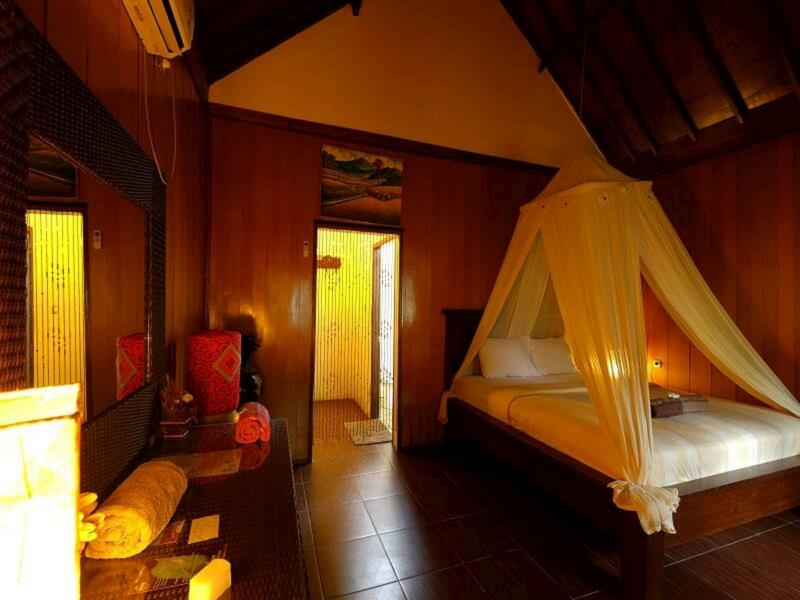 - They use coloured linen and towels which is particulalrly smart in Bali - they never look dirty or washed off. Smart choice! The meh: - Lots of mosquitoes, so make sure to bring your own repellent and tablets for it - the one provided isn't enough *there's plenty of powerpoints though, so you can have a few running at the same time. - No hooks in the bathroom despite it having lots of space - not very convenient, we had to drop clothes on the toilet. - A pool would be nice - the back garden is quite bare and could definitely be upgraded into a pool - wait, am I dreaming? :))) The verdict: we'll be back, overall loved our stay. Thank you Salim Cottages! 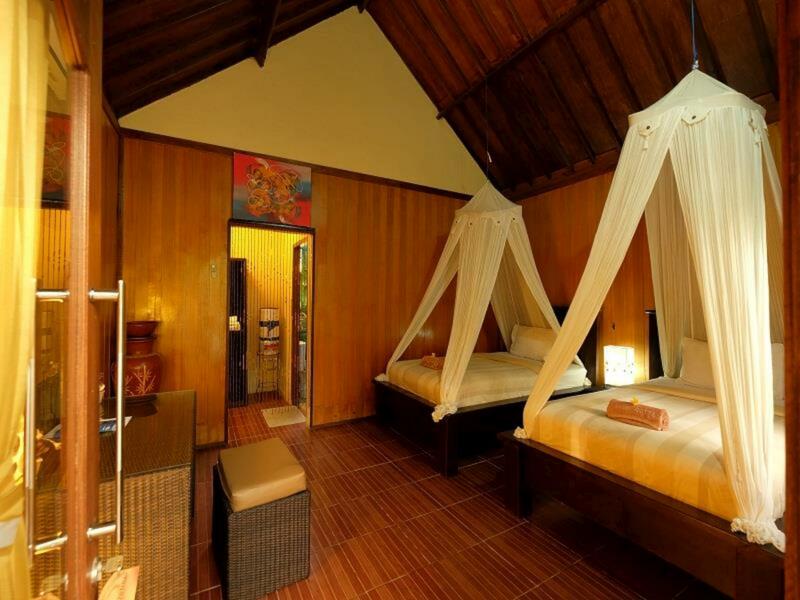 Really good stay, large rooms/bungalows and a tropical semi-open air bathroom. I would recommend this place to close friends and family - not just random people online! Rooms were a bit dark, but small porch w/ hammock made up for it. The porch area is really nice, but you'll want to be in the first 'front' of rooms, as the bungalows up the back aren't surrounding and looking on to the nice garden - maybe ask Reception, "Hey, can our room be in the front in the nice garden-y area?". Staff were really friendly and have great English (not that you should expect that as a traveller when you're in a different country - but it is helpful). Good 2 night stay. Clean and tidy. No pool but I knew that and as the staff pointed out, there is a big one next to the bar!! Arranged a dive trip through ADA and ended up with a private boat. Friendly staff, good food and strong cocktails. 10 min cart ride from the Port so well placed. All in all a pleasant stay. No issues at all. The room was a bit old but still okay and clean. I like the Garden which separated each room from each other. The restaurant offered fresh and affordable seafood at night and it just faced the sunrise. Though there were not many options for breakfast. The staff were very friendly. No swimming pools or other facilities.